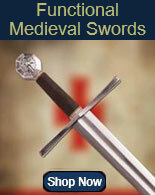 Medieval and Renaissance Clothing for sale are available in a variety of different designs and themes. These museum quality garments are designed for medieval fairs, Renaissance festivals, pirate fests and period themed weddings. 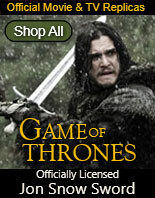 From boots to belts, gowns to hats, buy Medieval and Renaissance attire and accessories all on sale now. Cavalier Shirt for sale features a handsome medieval design. This lengthy shirt is manufactured of rich black cotton velvet. The Cavalier Shirt has a lace-up neck. The sleeves feature an opening with a silver satin interior sleeve. 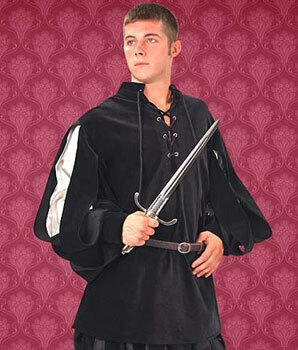 This shirt can be paired with a medieval sword or fencing sword to create a Renaissance costume. 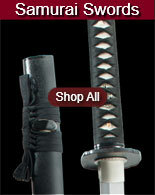 Or pair it with a fantasy sword to create a sci-fi look. Buy the versatile Cavalier Shirt for only $89.99.